These white suits are necessary because oil can cause skin irritations, but can make the workers very warm, experts say. 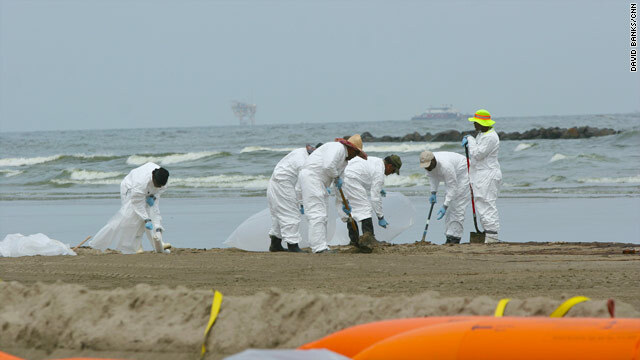 (CNN) -- Rising temperatures are adding to the perils of cleanup efforts on the Gulf oil disaster, and workers' heat-related illnesses are now the primary worry for local doctors and nurses. "Our big issue with the health is the heat-related stuff," said Dr. Robert Chugden, director of emergency medicine at West Jefferson Medical Center in Marrero, Louisiana. "Initially we had issues with fumes and dispersants being sprayed, but that seems to have faded away." Heat indices in the area ranged from 100 to 115 degrees Fahrenheit on Thursday, according to CNN meteorologist Reynolds Wolf, who said the extreme heat is expected in the Gulf through the weekend. West Jefferson Medical Center's first-aid tent for oil leak workers in Grand Isle, Louisiana, has treated 66 workers who had some heat-related problem since it opened May 31; only one other patient has been seen who did not have heat-related symptoms, said Taslin Alfonzo, spokeswoman for the hospital. Reported heat-related symptoms have included dizziness, headache, nausea, muscle cramping and shortness of breath, Chugden said. The tent, staffed by a nurse and paramedics, offers fluids and a cool place to rest to these patients. A clinic offering more complete medical services and staffed with physicians is planned on Grand Isle. Currently, patients who have more than mild symptoms must be transferred about 50 miles inland to the main hospital, Chugden said. "Fortunately they are working in teams, so it's unlikely anyone is going to suffer from an actual heatstroke -- basically they'd become unconscious," he said. Heatstroke is generally marked by a body temperature higher than 104 F with mental status ranging from personality changes to coma, according to the Mayo Clinic. Symptoms can include fainting, lack of sweating, rapid and shallow breathing. Some workers also received oxygen for shortness of breath at the tent, Chugden said. Pre-existing conditions such as asthma make some people more susceptible to these symptoms. In addition to heat problems, workers have also complained of headaches, sunburn and insect bites, she said. The 67 patients at the tent were released after treatment. The Louisiana Department of Health and Hospitals does not keep track of cases of heat exhaustion because it is difficult to separate out as a symptom, said spokeswoman Olivia Watkins. Occasionally patients do come in complaining of symptoms that may relate to fumes, Chugden said. Many of the cleanup workers are wearing Tyvek suits, disposable protective coverings that protect them from the chemicals, said Dr. Jimmy Guidry, state health officer for Louisiana. These suits are necessary because oil can cause skin irritations, but can make the workers very warm, he said. The suits trap heat near the body, don't allow the air to cool the skin, and probably hinder the evaporation of sweat, Chugden said. Some patients have speculated that work conditions are a lot hotter around the oil, he said. Health experts recommend that workers keep themselves hydrated and take in salt, in the form of something like potato chips, Chugden said. They should sit down and unzip their suits during breaks. "They're going to have to make sure that their activity is in spurts, short spurts, and drink plenty of fluids, otherwise they're going to get dehydrated and get in trouble," Guidry said. Medical professionals should take into account whether a patient with heat-related symptoms has been taking medicines, such as those for blood pressure, that would throw off salt balance, said Dr. Doug Swift, associate clinical professor in the department of medicine at Tulane University, who is not involved in caring for oil spill workers. Allergies medications may also make a person more susceptible to heat stress, he said. In Orange Beach, Alabama, workers cleaning up the beach area wear long pants and hard-soled shoes, Joint Information Center spokesman Brian Sibley told CNN. They work in shifts of 15 to 20 minutes, then get out of the sun and rehydrate, he said. BP spokesman John Pack said the company has about 20,000 people working on the oil leak cleanup, and is taking precautions against the heat. The company gets both water and vitamin-rich beverages such as Gatorade, and make sure they take regular breaks when they're working. "We obviously monitor in advance what the likely temperature is going to be so we can give advance warning of when the heat's going to be even more of a problem," he said.